If you have seen very fine and random cracks that are not very deep and are in a random pattern in your concrete, this is referred to as craze cracking. It	usually	occurs	when	the	top	surface	dries	too	quickly,	causing	that	surface	to shrink at a different rate than the surface underneath it. These cracks are very small and are found in the top surface of concrete. The most important factor that causes concrete crazing is humidity in the drying period in the wetting and drying cycle. A surface layer rich in cement will experience greater stress and be more subject to crazing. The cracks do not impact the performance of the concrete slab, but are merely a visual blemish. If you have just poured a new slab in your Kansas City or St. Louis home and it is showing signs of crazing, you are more than likely disappointed. These surface cracks are more cosmetic in nature, as opposed to cracks that will cause major damage to your concrete. However, you probably don't want your concrete to be full of cracks and to look like a bunch of puzzle pieces. Polyjacking.com offers concrete crazing solutions for any type of concrete slab you have: patios, driveways, warehouse floors, decks, and so on. Don't let concrete crazing leave you with an unsightly concrete slab. Polyjacking.com will repair your residential or industrial concrete and make it look new again without concrete replacement. 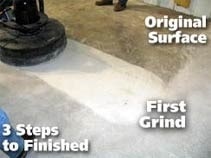 The process is fairly simple and involves grinding off the top layer of concrete to leave a smooth, unblemished surface. Once the process is complete, your concrete slab will be restored to its original look without losing any of its durability and strength. Polyjacking.com is a family owned and operated company that has been in business since 1978. We use only the best products and poly equipment available for concrete repair in St. Louis, Kansas City, and the surrounding areas. Our experienced crew can handle any size project. Don't hesitate, contact us today!